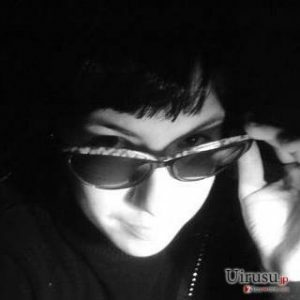 UltraLocker ransomware uses sophisticated techniques to infiltrate computers and hide from its victims. Use Reimage to determine whether your system is infected and prevent the loss of your files. When did this malware sneak into my device? How quickly can I remove the ransomware? UltraLocker virus is a newly detected crypto-ransomware which is constructed on the basis of CryptoWire ransomware project. Due to its elaborate structure, the ransomware sneaks into the device and encodes all your important files with an AES-256 encryption algorithm. As a result, this virus poses another riddle for virus researchers. If this cyber misfortune has befallen you as well, the first thing you do is to remove UltraLocker from the device. For that reason, an anti-spyware program, such as Reimage, might be a better solution. While the elimination process is running, find out how to prevent the assault of such ransomware in the future . There are already a couple of dozens of “Locker” themed viruses roaming around the Internet. Though most of them are entitled after notorious CryptLocker ransomware. The latter has emerged a couple of years ago and rampaged on the Internet for a while. However, recent reports show that there has been a steady increase in the cyber assaults of this virus . However, not all imitations are as powerful as the original virus. The current malware uses the prevalent method of AES encryption technique, specifically 256-bit variation. Due to multiple cycles of ciphering the, finding a decryption key is a complex challenge . In comparison with 128-bit or 192-bit encryption keys, AES-256 generates a key consistent of multiple ciphers. Likewise, the hackers exploit this feature in order to exert pressure on victims. In comparison with other file-encrypting malware, UltraLocker malware attaches [file_name].locked. [file_extension] file extension to all locked files. After you realize that all your important documents and other personal data is encrypted, the ransom note emerges displaying instructions of file-recovery. 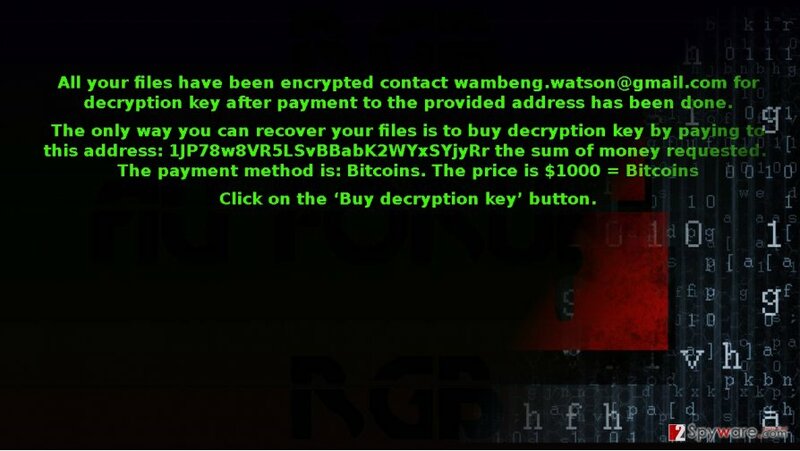 In comparison, with other threats, UltraLocker ransomware requires quite a delicate amount of money – 1000 USD. According to the instructions, you should contact the fraudsters via wambeng.watson@gmail.com and provide a unique identification number. Though its predecessor, CryptoLocker has managed to wreak enough havoc even among law enforcement institutions , at this rate, paying the money does not boost any chances of recovering the files. In any case, we recommend you to hurry up with UltraLocker removal. If you opened a spam email containing a tax report, delivery information, or tax refund form, likewise, you might have facilitated UltraLocker hijack. The malicious binary hid in the attached file. Therefore, clicking on it only accelerated the infection process. Despite the content of spam messages, you should not rush opening it as it might only mediate the ransomware attack. Beware of DHL fake delivery email notices . Such diversion is also aimed at users to persuade them into activating the attached binary. Take an attentive look as you might spot usual ransomware hints grammar mistakes, typos, an absence of full credentials. In addition, keep out of questionable domains crammed with fake download buttons or adware. Similar domains might disguise tech support scams. The recent trend reveals that some ransomware, such as VindowsLocker even impersonates a tech support scam even though the very malware is a file-encrypting threat. At this rate, the most reliable method of eliminating the malware is to remove UltraLocker virus with the assistance of Reimage or Plumbytes Anti-MalwareMalwarebytes Malwarebytes. Updating the anti-spyware utility is vital since outdated version might fail to detect all elements of the ransomware. This program is also a practical tool in confronting less destructive but, nevertheless, annoying malicious files and PUPs. Only when you get rid of the virus, start data recovery process. If you cannot complete UltraLocker removal because the malware locked your computer screen or corrupted the operating system in some other way, follow the guidelines. Log in to your infected account and start the browser. Download Reimage or other legitimate anti-spyware program. Update it before a full system scan and remove malicious files that belong to your ransomware and complete UltraLocker removal. When a new window shows up, click Next and select your restore point that is prior the infiltration of UltraLocker. After doing that, click Next. Once you restore your system to a previous date, download and scan your computer with Reimage and make sure that UltraLocker removal is performed successfully. Guide which is presented above is supposed to help you remove UltraLocker from your computer. To recover your encrypted files, we recommend using a detailed guide prepared by 2-spyware.com security experts. If you in a desperate situation finding a solution, this program might help you restore some of the encrypted files. Though the program is designed to recover the deleted files, in this case, it might also come in handy. What is Windows Previous Version feature? If System Restore is enabled, you can access the previously saved copy of each file. Note that this method requires more time. There are fair chances that you will retrieve your files since the program recreates the files according to shadow volume copies. They are automatically created by the operating system. Since there are no reports that Ultra Locker virus deletes them, you might stand a chance. ^ David Balaban . 22 Ransomware Prevention Tips. Tripwire. The state of security. ^ Bruce Kerr. CQ warning after rise in Cryptolocker hacker attacks. Lismore Echo. News, sport, lifestyle, community. ^ Tom Henderson. Learn AES256 on Your Lunch Break. SmartBear. The leader in software quality tools for teams. ^ Paula rReed Ward. Law Enforcement Agencies Nationwide Deal with Malware, Ransom Demands. GovTech. Smart media and research company focused exclusively on public-sector innovation. ^ Elizabeth Weise. 'We could not deliver your parcel' email could be scam. USA Today. Multi-platform news and information media company. This entry was posted on 2016-12-12 at 01:14 and is filed under Ransomware, Viruses. You can quickly scan the QR code with your mobile device and have UltraLocker ransomware virus manual removal instructions right in your pocket. How did you remove UltraLocker virus?